After 10+ years on medication for an autoimmune disease, Jennifer Mac’s happy to say she kicked the ol’ bottle... pill bottle, that is! With roots on a farm in Idaho, Jennifer Mac traveled overseas and got her start pioneering the raw food movement in China after graduating from Living Light Culinary Institute in Northern California. 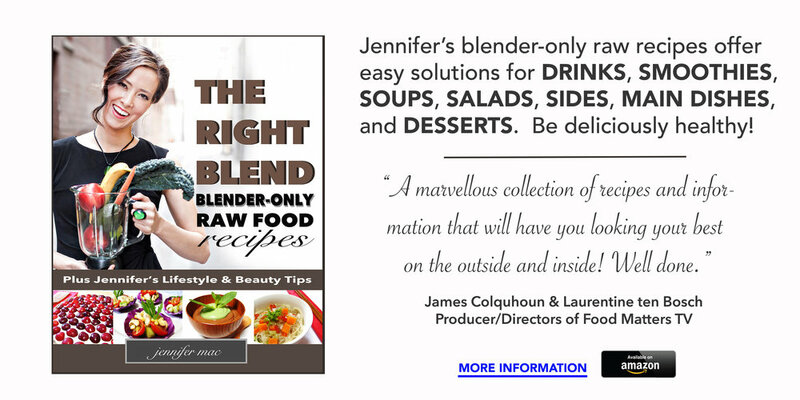 She is a raw food and whole food chef and the author of Detox Delish: Your Guide to Clean Eating and The Right Blend: Blender-only Raw Food Recipes. Jennifer Mac’s journey is one of entrepreneurship. As the only American girl at the time, Jennifer Mac worked in Beijing’s famous pearl market district, learning the ropes of China’s wholesale market. Jennifer Mac’s business background includes Public Relations Director for the Idaho Senate Caucus, International Trade Specialist for the Idaho State Department of Agriculture, Trade Specialist for the Idaho Department of Commerce with prior internships at the US & Foreign Commercial Service (Chengdu, China PRC) and the Joint Finance-Appropriations Committee (Idaho). Jennifer Mac currently works as a political consultant for local public servants and has volunteered for one national campaign. She studied History with thesis work in Sino-Iranian Relations. You are welcome to use these photos with our and the photographer's permission. Include the photographer's credit for each image and the link where it is used. Thank you so much! CONTACT INFO.